The Association of Bermuda International Companies [ABIC] announced the winners of the Michelle Outerbridge Memorial Award, Stephen Edwards Memorial Award, and Shernelle M. Outerbridge Memorial Award. A spokesperson said, “ABIC is the voice of international business in Bermuda. 40 years ago Bermuda’s international companies took steps to create a Bermudian pool of talent to participate in this growing sector. “Annually the ABIC members sponsor The Michelle Outerbridge Memorial Award in memory of Michelle Outerbridge who was awarded an ABIC Scholarship in June 2000, and whose enthusiasm for life, academic ability and all round vitality left a lasting impression on all that met her. The $5,000.00 award was established in 2002 and granted to the ABICEA awardee who best emulates similar qualities of Michelle. “This year’s recipient is Sachio Harrison, a 2017 graduate of the Bermuda High School’s IB Program. Sachio is energetic and passionate about everything he does and has been a valuable volunteer with Friends of Hospice and the Bermuda National Trust. “In 2014 he spearheaded fundraising events for the LCCA and PALS which resulted in his being awarded the Youth Volunteer Award from the Centre on Philanthropy. Sachio has always been a high honors student who enjoys getting to the root of any problem and solving it and he will be attending the University of Western Ontario to study Mathematics and Economics with an end goal of becoming an Actuary. “The Stephen Edwards Memorial Award is sponsored by Lombard Odier Trust [Bermuda] Limited and was first awarded in 2015. Stephen received an ABIC Scholarship award in 2014 and he is being remembered as a passionate young man, gifted athlete and an outstanding role model to all that knew him. 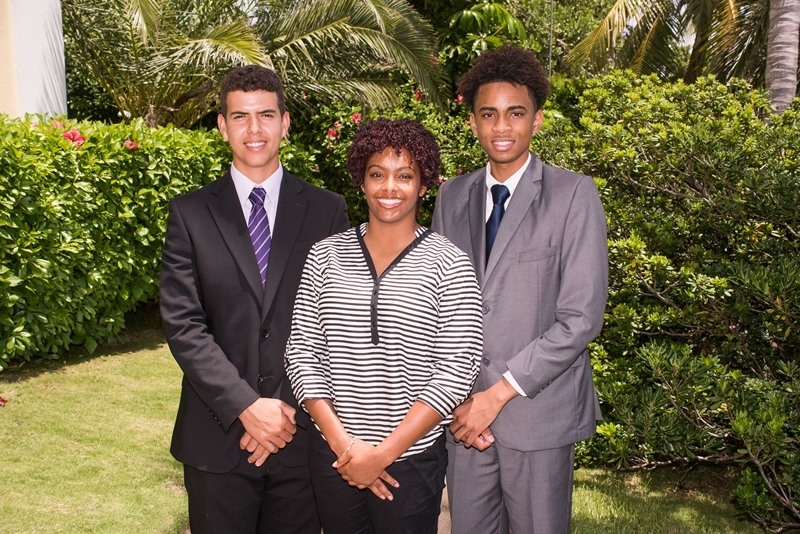 “The annual $5,000.00 award is granted to the ABICEA awardee who best emulates similar qualities of Stephen and this year’s recipient is Zantae Dill. Zantae is a 2016 graduate of Saltus and has completed her first year studying Law and Psychology at the University of the West of England in Bristol. Zantae is always an honor roll student and a stellar athlete and member of the Bermuda National Gymnastics Team. “She also volunteers her time in helping out at gymnastics and has been a mentor to young students at West Pembroke Primary. She was a nominee of an Outstanding Teen Award in 2016 and held the position of Acting Minister of Health and Safety in the Bermuda Youth Parliament. “In 2012 Zurich Bermuda created The Shernelle M. Outerbridge Memorial Award to be offered each year, as an additional $15,000 grant, to one undergraduate ABIC Scholar enrolled in business or finance. “Mrs. Shernelle M. Outerbridge was the late CEO of Zurich Investment Services Limited in Bermuda and was a recipient of a 1984 ABIC award, which helped her to achieve her Bachelor of Arts degree in Public Policy & Administration from York University in Toronto, Canada in 1987. “This year’s recipient is Theo Wolffe. Theo is a 2017graduate of the IB Program at Warwick Academy where he was on the Principal’s List for 4 consecutive years. “At Warwick Academy Theo was a Senior Prefect and President of the Student Council and saxophone leader of the Jazz Band. Outside of school Theo exhibits exemplary leaderships skills having been selected to represent Bermuda at the Berlin Model United Nations Conference in Bahamas in 2016 and the Global Young Leader’s Conference in China in 2015 and he was the winner of the 2016 Alpha Beautillion. Continue to make your family proud.